GREEN BAY — Mike McCarthy’s press conference on Tuesday focused on the greatest challenge the Packers have faced to date in this training camp: replacing Jordy Nelson. “Moving on without Jordy Nelson. First you have to recognize Jordy is what you look for in a Green Bay Packer. These things happen. It’s part of our game. It’s a tough blow to our football team. A good system, a good football team, adjustments are made. We need to improve,” McCarthy said of the news on Monday Nelson was lost for the season when he sustained a significant knee injury in Pittsburgh on Sunday. “Nothing has changed. The goals are the same. Our team identity is the same. How we go about our business every day; that will not change,” McCarthy added. Jeff Janis, Myles White and rookie Ty Montgomery would logically seem to the the prospects to become the Packers’ No. 3 wide receiver. Randall Cobb and Davante Adams are clearly the top two receivers. “I think all three of those guys understood the opportunity before what happened to Jordy. They’re going to play even more football Saturday night. 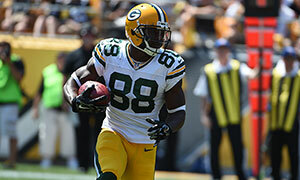 I think it’s loud and clear what’s available to them,” McCarthy said of Janis, White and Montgomery. Packers.com will provide a full report following practice and locker room interviews.